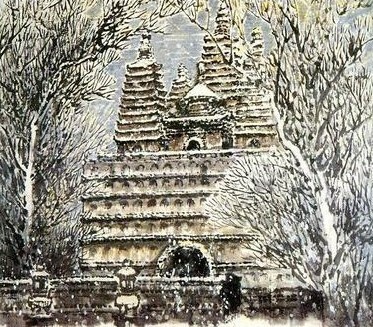 The Five-Pagoda Temple (wǔ tǎ sì 五塔寺), also called Jingangzuo Dagoba (jīn gāng zuò shè lì bǎo tǎ 金刚座舍利宝塔), located in the southern section of town, is a miniature temple built in Indian style, so named for the five four-sided pagodas that jut up from the rectangular base of the building. This is a pretty temple that is worth taking time out to visit, especially if you are in the vicinity of this older section of town. Originally the temple was used by followers and monks as a stuppa for relics and was, up until the Qing Dynasty (qīng cháo 清朝) (1644-1911 AD), a part of a larger complex, the Cideng Temple (cí dēng sì 慈灯寺). 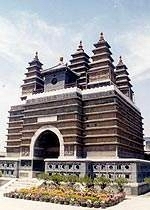 Cideng Temple had been ruined and only the five-pagoda remains and got its present name. Nowadays the temple is surrounded by a large, dusty, concrete yard, and a number of small shops selling postcards, incense and various Buddhist oddities. Compared with other pagodas, Five-Pagoda Temple is unique in at least two aspects: its special structure, pagodas over pagoda, and the green and yellow colored glazes on the short eaves and tops of pagodas. These make Five-Pagoda Temple quite special, a treasure of Hohhot City. The Five-Pagoda Temple is an important Tibetan Buddhist temple. The pagoda is 16 meters high (about 51 feet) and it is composed of three parts: the base, the seat and the top (five pagodas). The lower part of the seat is inlaid with inscriptions of Diamond Sutra written in Mongolian, Tibetan and Sanskrit. The upper part is niches holding gold-plated statues of Buddha. The body of the pagoda is glazed in greens and yellows. It is representative of the architectural achievements that were made in the Qing Dynasty (1644 - 1911). 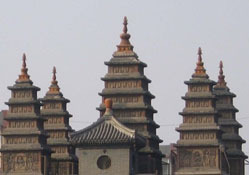 Five pagodas standing side by side on the seat, the central one has seven stories while the rest on the four corners are all five-story high. In the first floor of these pagodas, there are brick carvings of Buddha, Bodhisattva, Bodhi trees and so on. While in the floors above there are a great number of niches for statues of Buddha in different shapes totaling 1563. 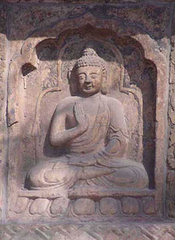 In addition, an astronomical chart and two Buddhism pictures are carved delicately onto a wall behind the pagodas, which are valuable cultural relics. Tourists can climb to the top of the base to get a look at the pagodas themselves, or head to the back of the building where a carved screen includes a rare Mongolian astronomical map, marking hundreds of stars (the only of its kind in the world). Address: On Wutasi Back Street (wǔ tǎ sì hòu jiē 五塔寺后街), just off Gongyuan West Road (gōng yuán xī lù 公园西路). How to Get there: There are numerous ways to get there. A taxi from most areas of town should cost no less than CNY 10. 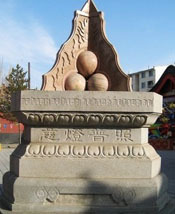 The temple is just to the south of Renmin Park (rén mín gōng yuán 人民公园), southwards along Gongyuan West Road. From the city center, bus No.1 will also take you there.